New England’s grand dame of road miles, the Newburyport High Street Mile, recently entered into major sponsorship agreements with Puma and the Institution for Savings for its 18th annual race. 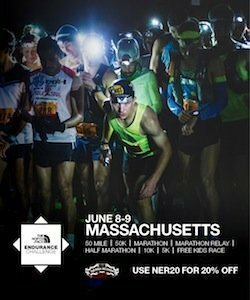 Race organizers are now offering over $3000 in prize money to the top athletes. This year’s race will offer incentives for the winner of the men’s open race to crack the elusive 4 minute mile. The men’s winner, if they break the course record and go under 4 minutes, will take home $1000 in prize money. The time for women to beat is 4:30. The prize money break-out for the top 3 in the Male and Female races is $400, $300, and $200 respectively. One of Kealey’s main goals since taking over the race in 2005 was to attract runners capable of running sub 4 minutes for men and sub 4:30 for women. The race is a USATF certified mile. The 16 foot point to point elevation drop should aid runners in their pursuit of the sub 4 minute mile. However, that barrier has proved elusive over the race’s 18 year history. While the prize money is important Kealey admits the importance of the race has to do with community involvement and giving back to High School athletes.